After the seminar, the students visited the Transmission Electron Microscopy (TEM) with Judith Oró, who showed them some 10-nm nanoparticles through the microscope. 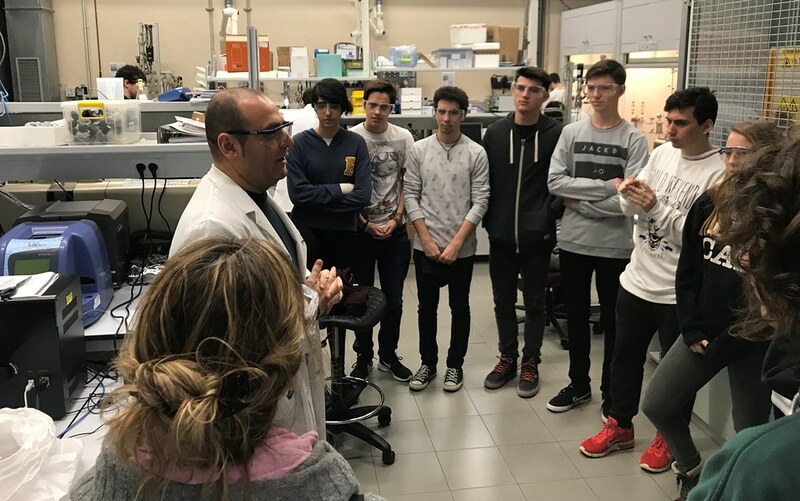 Roberta Ceravola, from the Thermal Analysis Lab, and Head of Hygene and Safety at ICMAB, explained them the basic rules for working in a laboratory. Amable Bernabé, from the SoftLab, explained them the research with supercritic fluids, such as CO2, and finally, Roberta Verrelli explained the basic concepts of batteries with the help of some lemons and some metal pieces. Do you know how many lemons would be necessary to charge an iPhone? Or an electric car? This visit was within the ESCOLAB program, who is in charge of putting in contact the different highschools with the research centers. This year, ESCOLAB organizes a contest for the students who visit research centers: they have to give ideas to resolve a scientific challenge. In our case, our challenge is: How would you use nanotechnology and materials science to be able to use all the energy that comes from the sun?